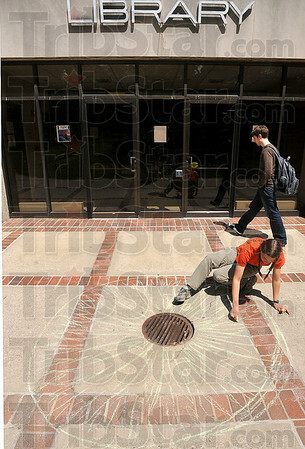 Artistic vision: Rose-Hulman mechanical engineering student Rachelle Cobb, 20, of Vancouver, Wash., puts the available chalk to use as she draws an eye near the library on the Rose-Hulman campus Tuesday. Students were invited to let their creativity run wild on Tuesday by using colored chalk to draw on the sidewalks throughout the Root Quadrangle in the center of campus. The "Chalk on the Walk" event was organized by the Department of Humanities and Social Sciences to let students showcase their creativity and have a creative release from the everyday academic pressures -- this is the second-to-last week of the spring academic quarter. Cobb was drawing the eye for another student who would know what it meant as soon as he or she saw it.